Recognising people as assets: people are seen as equal partners in designing and delivering services, rather than as passive beneficiaries or burdens on services or the system. Building on people’s capabilities: that each person has abilities and assets and people are supported to develop these. People are supported to use what they are able to do to benefit themselves, other people and their community. 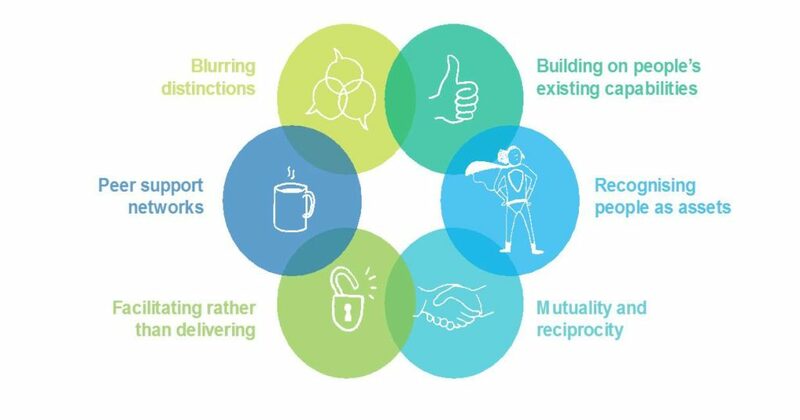 Developing two-way reciprocal relationships: all co-production processes involve some form of mutuality, a two way relationship between individuals, carers and public service professionals and between the individuals who are involved. Encouraging peer support networks: peer and personal networks are important to all of us; however these are often not valued or overlooked by professionals. Co-production means building these networks alongside support from professionals. Blurring boundaries between delivering and receiving services: the usual line or barrier between those people who design and deliver services and those who use them is blurred with more people involved in getting things done together.